What's gotten into Cseom!? In Aya and the Cubes of Light instead of keeping the Cubes running, he's taking the Energy Packs out of the terminals! The Cubes are the power sources of the stars, and if they stop working it gets dark! 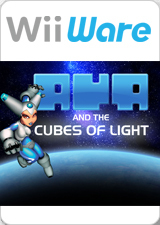 Play Aya, the daughter of the Cube Corporation. Teleport onto the Cubes to collect the Energy Packs to get the Cube engines working again. But it's not that easy to find your way around; you'll have to think around outside the box and mustn't get disorientated, even when you're upside down! The graph below charts the compatibility with Aya and the Cubes of Light since Dolphin's 2.0 release, listing revisions only where a compatibility change occurred.